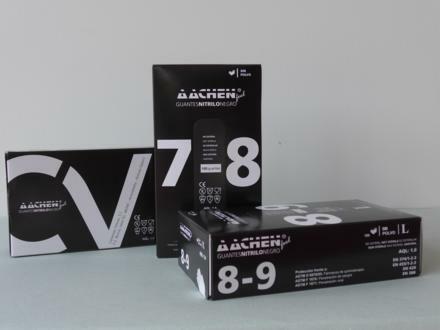 We are pleased to present you a new glove which increases the range of nitrile gloves: AachenFeel Black. This glove is equivalent in its properties to AachenFeel Premium, being the only difference between them the colour of the material. As you probably Know nitrile gloves of AachenFeel Premium range have extra thickness, elasticity and resistance. They are approximately a 20 % more resistant to breakage than conventional nitrile gloves. Moreover, they bear the same tensile stress. EN-374 (1-2-3) – Protection gloves against chemical products and microorganisms. UNE-EN-455 (1-2-3) – Disposable Medical gloves. EN 420 – Protection gloves. EN 388 – Protection gloves against mechanical risks. ASTM D 6978/05 – Chemotherapy drugs permeation test. ASTM F 1671 – Viral Penetration Test. For all of these properties, including their colour, it is advisable to use them in Security Forces (Police, Guards, Emergencies, etc. ), Cosmetic and Beauty Centres (Tattoos, Dyes, etc. ), Automotive Garages, Laboratories, Industries in general (metal, steel, building, metallurgical, etc. ), or in any area where chemical products, oil, fat, dissolvent products, etc. are used frequently. 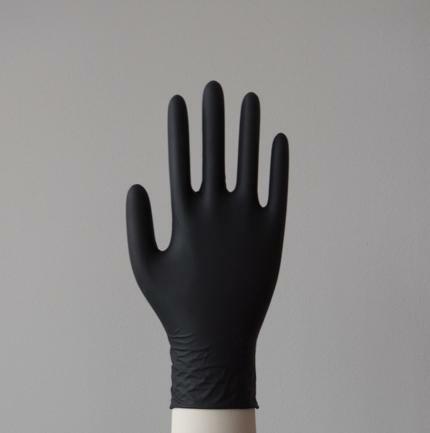 As all our nitrile gloves, these have a chlorinated internal surface which makes easier to put them on without the need of powder, they are exempt from natural latex and have an AQL quality level of 1.0.